Alexa is making quite a name for herself. 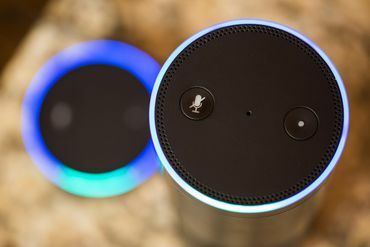 The “smart” voice-powered star of Amazon’s growing line of Echo products can play music, audiobooks, games and more; all you have to do is ask. She can also play podcasts. That’s definitely one of the Echo’s most overlooked and underrated features, though there’s definitely room for improvement. Indeed, while it’s impossibly easy to play a podcast — the Echo pulls directly from TuneIn, which has zillions of them — things get a little murky when you want to venture beyond the basics. Suppose, for example, you want to listen to Wendy Zukerman’s awesome Science Vs. Just say, “Alexa, play the Science Vs. podcast.” Presto! She immediately starts streaming the latest episode. Same goes for, oh, I dunno, Battlestar Recaptica. But note the key words there: “latest episode.” Want an earlier one? You do have the option of saying, “Alexa, play the previous episode.” Want the one before that? Say the phrase again. And on and on. It’s a terribly clunky way to get to the episode you want — assuming you even know where it falls in the order. Knowing the title or number of the episode doesn’t help; Alexa can only play the most recent one. Once you’ve found the show you want, you can drill down to the episode you want and tap it to start listening. Again: clunky. A (slightly) better way: Pair your Echo to your phone or tablet, then use your preferred podcast app to queue up the show or episode you want. You’re still limited in what you can do by voice command, but this is still faster and easier than wading through the Alexa App. One important thing to note for podcasts queued up using Alexa proper: If you switch over to some other kind of audio midshow — say, some music or another podcast — you can’t resume the original stream from where you left off. Alexa can’t remember your playback position, at least at the moment. That’s another point in favor of using your a podcast app, even if does mean losing out on some voice-powered convenience. Alexa Which Is Smart Light Bulbs Should Be Used?